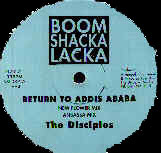 The Disciples are well known on the UK Dub scene, but have never been afraid of pushing the boundaries. 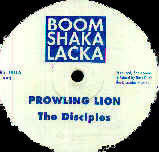 From their infamous dub plates for Jah Shaka and their own Boomshackalacka soundsystem, to their tracks on the avant garde Macro Dub Infection compilations, to some more techno-tinged excursions, their versatility and dexterity is legend. Your recent output seems to have moved away from the heavy UK dub stuff that a lot of people know you for and into what you've described as a more "orthodox" vocal reggae - what were the reasons behind this? Was dub becoming less satisfying for you after 15 years of making it? To a certain extent a particular style of dub was becoming less satisfying, I was a reggae fan before making music, I was into the music from the likes of the Studio One output of old up to the brand newest Jamaican pre-release. I've always loved Ja. music whether it's dub or vocal and the emphasis in Ja music over the last 15 years has been the vocal in some form, DJ or singer. When I started making music I didn't have the facility to do vocals and, at the time, I didn't know any singers so I made dub. As the years progressed we forged our own style here in the UK, alongside people like Dred & Fred, Mannaseh, Iration Steppa`s etc, but I felt I took it as far as I could with the style, and other than going full tilt into some 'techno, breakbeat' dub thing I decided it was time for me to move into doing the music in the way of which I loved, which was as `orthodox` reggae. Well, in a way it's like starting again to some extent. We had a mixed crowd that was into the dub thing. We had people from both the reggae background and from techno/house background, whereas most of the reggae people have kept up on what we're doing now some of the techno crowd haven't, but they would have and did move on anyway, probably checking music from D 'n' B and garage or even more techno type dub things. Now were getting a following of more dedicated reggae lovers, our recent shows have gone down very well. We tore it up in Amsterdam and again in Israel, and with Israel I think we were only the second `sound` playing there, Jah Shaka was earlier in the year. So it's very fresh to them, the style that we bring, the heavier roots reggae and the UK sound system style which is different from the Ja style. Sales wise things are slow, the one thing UK reggae doesn't have is a good network for distribution and promotion, and in the UK reggae doesn't get much look in from the media, how much do you see in `zines like Mojo and NME etc about new reggae, and how much airplay does it get on national radio, very little. So it's hard, we have to look to foreign but with the strong pound this is also difficult, still we work at it and hope for a brighter future. There is an enormous nostalgia for dub, reggae etc from the sixties and seventies. Does this frustrate you, as someone who is clearly trying to create music for now and for the future? But saying all that, reggae is hard for people to get into thru the way it's presented, still coming out on 7" singles etc which only the specialist shops deal with, you need to follow it very closely and this can be very time consuming, you need to be dedicated. 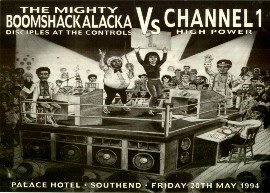 Was the seventies the "golden age" of reggae - never to be repeated? The thing with the 70's is that reggae became very popular with the white 'rock' crowd, it had already done big things in Jamaica for its own crowd, but when Marley and others got into the American and UK audiences it just lifted. The freshness in music style and production as well, the funky rhythms from the Wailers Aston & Carlton Barrett, the bizarre sounds outta Lee Perry's mind, the `far east` sounds of Augustus Pablo, the spiritual sounds from Yabby Yu, the unique sounds of dub from King Tubby... You cannot repeat this, all that has happened since is the continuation of these things in a more modern style. Those that have kept up with reggae music and appreciate it now can see the subtleties in what's being done now and love it still but its not really as fresh in the same way, there's only so much that people need to take in of Rasta, dreadlocks for non rasta is just another hair style, red, gold and green...blue, pink and orange... just colours... bizarre sounds in music, every music maker in the land can do that... dub, just heavy bass, lots of reverb and echoes and some minimal mixing, it's nothing new. 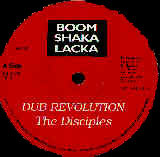 You've been involved with the roots/rasta scene for some time now and the lyrics of many Disciples records reflect this. I was wondering whether you would consider yourself to be rasta, or whether it's just something you feel a connection with and draw inspiration from? The latter part of the question answers this. As a lover of reggae music I fail to see how anyone can't take in the messages that are presented, as an individual I try and live a good life and try to be good to my fellow man. Too many people want some kind of power over another and I see this in religion as well, so I don't adhere to any religious order. I don't feel I need to know what's right or wrong, but if religion helps someone to live a good life then I have no problem in that, just as long as what they say is what they do. Life is an inspiration. Have you made any connections with Jamaican producers - any plans to collaborate with them or go to Jamaica? I have a connection with Bertram Brown who runs the Freedom Sounds label, that label released roots classics in the 70`s with artists like Prince Allah, Earl Zero, Phillip Frazer, Rod Taylor etc, recently they have put two 12" singles out which are my productions, a remix of a tune I released a few years back by a singer called High Priest (Judgement Seat) and a next cut upon the same riddim by our new upcoming singer Danny Vibes (Mankind Affi Break The Barrier). 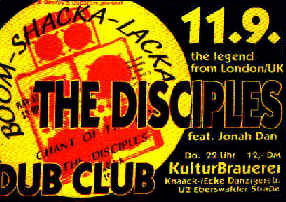 They have also asked me to do a dub album so I've been going thru their old tunes and finding loops and samples and I'm gonna do a `Disciples Remix Freedom Sounds Ina Year 2001` album for them. I haven't been to Jamaica as yet but I've got a few connections now and maybe I'll get there soon and see what works I can do. Your web site is an excellent resource and I've seen a number of posts from you on the rec.music.reggae newsgroup. How has the Internet changed what you do and the reggae/dub scene as a whole? I thought I'd try the Internet after being shown it by John from Alpha and Omega. I was a bit of a computer phobic before, but I'm not scared to try things so I thought I'd give it a go. When first on I couldn't find too much `informative` reggae stuff, loads of lists of records without any review and loads of Marley, so I thought I'd do my bit, figuring that if you give people more of an idea about the style of a tune it makes it easier for them to get into it. As with most forms of music, reggae has its different styles and it's usual that those that like one don't always like the other, a roots man may not like ragga etc. Anyway things have progressed a little now for reggae on the net, but I don't think it's revolutionised anything. For me the e-mail thing has been useful, making contacts all over the world, which has helped me get shows and helped the music get a little wider airplay, I think it's still progressing. Any thoughts on how things will develop in the future (Napster, mp3s, etc)? I haven't really got too far into the MP3 thing yet, the computer I use can't record from the stereo input, don't ask me why!! Some people I know are concerned that they will lose sales because people can easily download your tunes off the net. I recently checked out 'Napster' they didn't have that much of my stuff or some other artists I looked up, then again I found loads of Alton Ellis, Jah Shaka, Pablo etc so maybe this will be detrimental to our business, and if we the artists don't make money with our music we can no longer make music, then the listener will suffer! What records are doing it for you at the moment? Current Top Ten? As mentioned I'm doing a dub album for Freedom Sounds in Ja. 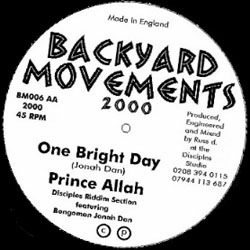 I'm also gonna release a dub album here 'Disciples presents Backyard Movements Dubwise 2001', that should come late February early March. We have a project with Prince Allah that needs some finishing and will result in a showcase album of 7 vocals and their dubs. We have finished projects with local singers Danny Vibes and Delroy Dyer, also working on album with singer Tony Roots, have done some remix for some other guys, the Whizzkids with vocals from Paul Elliot and Sandeeno, there's nuff things doing, and hopefully more connections with Jamaican artists, we'll see.